In the past I have had a hard time finding great menswear style in Paris but maybe I was just looking in the wrong places. 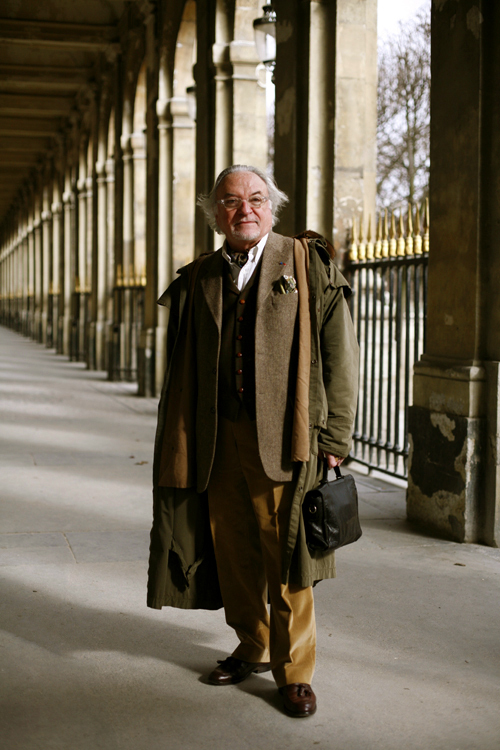 I have been really inspired by the gentleman I found the last three days – I’m hitting my Paris groove. first comment? i love that all the dressed up men in your photographs have pocket squares. you never see that around where i live. A marvellous look. The waistcoat with lapels is nice, but the highlight is the cravat – more cravats please, Sart! Also nice to see trousers without turn-ups. I’ve noticed quite a few examples of stylish turnout on my trips to Paris – has the place gone downhill recently? Well, this guy is dotting and crossing all his fashion i’s and t’s, and to good effect. The shoes seems particularly nice. What is it with French men’s tailoring? I always thought it lacked the sexiness and craft of the Italian kind, on the one hand, and the timeless correctness and, well, craft of the British sort on the other. It was all line looking for a place to go. But I think it’s gotten/getting better, more vital, more interesting in some way, as you observe…. Sart, it’s shots like this that make me keep hoping you’ll do a book…this is stunning work. i love hanging out at the palais royal eating chocolates and watching kids play. that pic just made my dreary rainy day! Sart, It doesn’t get any better than this! He is magnificant in every sense! 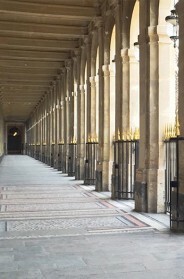 And your photo is entransing-with the pillars-brilliant! Oh, perfect! This makes me want to reach out and touch every layer of fabric, right down to the leather of his shoes – the colors and textures are so rich! I love the muted, rich colors. The green overcoat, the mustardy tan pants and brown shoes are wonderful together. Lovely buttons on his vest, and I appreciate the way his overcoat is hanging just so from his frame, revealing the layers of his outfit. Flou with tweed and pocketsquare. If this man’s place of work is the Palais Royale, je suis verte avec jalousie. What a scholarly-looking outfit. The colors mesh perfectly. In this world where youth is over prized, your pics of classy older men are such a relief. I don’t know what Walter Benjamin actually looked like, but this to me is the ideal dust jacket photo of him, with the arcades of the Palais Royal in the background. What a fabulous picture. Love his combination of colors. The assortments of green, mustard, and green make this combination absolutely brilliant. There’s something about this gentleman. His style appears effortless, but as he still takes care. I dig it. it’s fine except for the purse. there are plenty of really good-looking briefcases in the world, if you need to carry more than can fit in yr pockets. Not just wonderful clothes … but wonderful framing and photography as well! Love it! To find great men’s style in Paris, you might try the ministerial quarter. Best dressed men in Paris! Also, the best custom shoemaker on rue Vaneau. I am looking for a painting of hans hartung named the café royal de paris .could you help me.